PRODUCT: Powers Fasteners .300 Head Drive Pins with 7/8" Washer, 1" Shank. 100/Box. 10 Boxes/Case. Price/BOX of 100. (Order full cases for discounts). 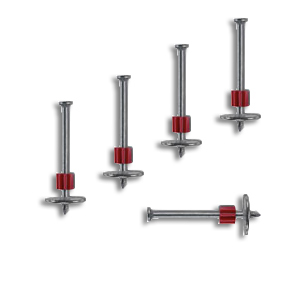 To provide resistance to pullover, these pins are available with preassembled 14 gage (0.075") metal washers in various diameters. Resistance to pullover is increased by the additional bearing surface provided by the washer. The insulation washer has a thickness of 0.035".